After a year of Batman Eternal, we have finally come to the end. What is the fate of our beloved dark knight? As always, for the last year, we begin with the cover. Batman stands in front of eight of his enemies who are cowering in fear of him. This is an unusual cover for a final issue and I quite like it. It is very eye-pleasing. Batman looks very menacing and almost demon-like. There is some extra names on the cover which means that they could have needed more artists to finish it. Hopefully it doesn’t mean that this issue was a rush job. We begin with a flash-back as we see Cluemaster on the phone with his daughter, Stephanie Brown. We learn that back then, Stephanie Brown admired Batman and Cluemaster was angry at the world because of it. For him, this makes sense. He was already a villain at this point and having his daughter worship Batman it would be a kick in the ego for Cluemaster. Cluemaster breaks into a mansion to look for the infamous Court of Owls, a secret society that runs Gotham behind the shadows. While we don’t get an explanation on how he found out where the court was, everyone in Gotham knows the myth of the court. I would like a quick mention of just how Cluemaster found this location. Moments after Cluemaster finds a secret room Lincoln March appears to him and offers help. For some reason, Lincoln March has grey skin. The thing is, the Court of Owls has the ability to bring people back from the dead. As we turn the page, we move back into the present where Lincoln March is talking to Bruce Wayne but Bruce Wayne doesn’t want to hear his story. This was an excellent way of tying how Lincoln March got involved to the current story. Lincoln March grabs Bruce Wayne and flies off the building where a fight scene starts. We get to see a mid-air fight scene with Bruce Wayne grabbing a piece of glass out of his back and jabbing Lincoln March’s jet pack. The whole scene is very intense and well-drawn. Bruce Wayne and Lincoln March crash into the side of a skyscraper but you that they can’t be dead, we still have 20 more pages! The way that Lincoln March and Bruce Wayne crash is very similar to every jet pack battle that you see in movies. Elsewhere, Julia and Alfred try to get in touch with Bruce Wayne as they also check up on the status of the rest of the Bat family. This scene sets up the situation where everyone knows that the main character is in trouble. In another part of town, we have two groups of people in two different locations and all saying “what are we going to do?” This is a great way to tell the reader the scope of the disaster in Gotham. We return to Batman and Lincoln March as they recover from the crash only to have Lincoln March taunt Bruce about being his baby brother. This of course starts a fight in which we see the capabilities of Lincoln March’s power suit. The fight continues with Lincoln March easily getting the upper hand. During this fight, Lincoln March compares Batman to King Arthur which is interesting. Lincoln March grabs Batman by the neck only to have Bat symbols appear every building around him. This is an interesting distraction and I wonder who thought of this and why. We soon learn that this whole plan was Jim Gordon’s idea to unite the citizens of Gotham. Jim Gordon gives a speech that you would hear in any war movie but I don’t care as the speech is that awesome. After the speech, Jim Gordon looks towards the burning city to see Bat signals all across the sky while he is praying for everyone to come out safe. What we need right here is theme music done by a full orchestra. As the city gets riled up we cut to Spoiler who is trying to leave the city but nearly gets hit by a car. She gets saved by a random stranger who tells her that the city needs to stay together like Jim Gordon says. This is a great way to have the Spoiler stay in Gotham. Makes her realize that all Gotham needs to work together. In another part of town, Batgirl rescues the Red Hood from being crushed under rubble. Then out of the blue, Calvin Rose comes to quickly transport the pair out of the building. We have not seen Calvin Rose in a year. Those who don’t know, Calvin Rose is an ex-Talon of the Court of Owls. As the building blows up behind the three heroes, we get to see the extended Bat family helping out to save Gotham. As much as I like to explain who they are, I do not have that kind of time and I am really surprised that the writer put them in this issue. In a different part of town, James Bard and Maggie Sawyer find out the killer Croc and Selina Kyle are helping people evacuate buildings. The two pairs have a short argument but soon realize that they are both working for the goal. This makes a lot of sense. In times of crisis enemies need to become allies in order to come out alive. We continue with the fight between Batman and Lincoln March where we see Lincoln March about to kill Batman when the Spoiler comes in to save Batman. The weird thing about this rescue is that the Spoiler is trying to convince Lincoln March that she is Batman. I don’t know why. The rest of Batman’s allies come to his aid and surround Lincoln March but he blows a hole in the floor and runs away. They could have easily ended the story here. These next couple of pages need to be good. Jim Gordon rescues Batman and convinces him that the fight is over. We know Lincoln March got away but bad guys always get away at some point but right now Gotham City has won. One week later James Bard is going by his true name, Jason, and is trying to get Vicki Vales forgiveness. Vicki Vale allows Jason to take her for dinner but it’s not clear if she forgives Jason or not. This is what I would prefer to resolve the James Bard/Vicki Vale story arc. If Vicki Vale totally forgave James Bard it would be too unrealistic. Selina Kyle calls Batman to her club to inform him that she is the Head Crime Boss of Gotham and there nothing that Batman can do about it. This will continue in Catwoman #35 and will show the readers how Batman and Catwoman’s relationship will end. Give it a year and Selina Kyle will be back being Catwoman. Among the ruins of Arkham Asylum, Batwing meets Jim Corrigan where he offers Batwing a position on his paranormal and magic detective squadron in the GCPD. Only in DC comics will you ever see a paranormal department in a police organization. I don’t know if Batwing will take the job. Currently Batwing is not in the “Gotham By Midnight” series but that could easily change in June. At the apartment of Jim Gordon, we see Barbara Gordon aka Batgirl taking care of Jim Gordon and having some much over-due father-daughter time. We knew that this scene was eventually going to happen one way or another. Jim Gordon needed a happy ending after all he had been through. In a bar, the Red Hood is drinking his sorrows away as he gets a phone call Roy Harper to get back to the Outlaws. I kind of wish there were more character development with the Red Hood. It just seems like he is back in the same position he started from. In the apartment of Harper Rowe we learn that Stephanie Brown is her room-mate now and Red Robin has come to congratulate her on becoming a full hero. While I would not like a Bluebird comic at this moment, Harper Rowe’s character has really evolved through this series. Stephanie Brown walks in to meet Red Robin but this starts an awkward conversation. I hope the writers plan to set up a romance between Red Robin and Stephanie Brown like they had before the 2011 reboot. Underground, the Court of Owls have a trial for Lincoln March resulting in Lincoln March being put into a coffin alive and sealed away. I wonder how long the writers are not going to use this villain. There are many questions left unanswered but we are probably going to have to wait a year to find out. We end this comic and series with Batman and Jim Gordon having a conversation about how these events only made the two stronger and now nothing can take them down. Guys, just wait until End Game. Your thoughts on this matter will do a compete 180. This issue was long but it needed to be long. This will set up the Batman stories for the next year and I can’t wait for what will come out of it. Batman Eternal is a must read for any Batman and comic fan. This story was an epic, the writers made that clear from the beginning. Yes it had flaws but no one will remember them at all. We will remember the story that gave us the Batman story that the fans wanted. 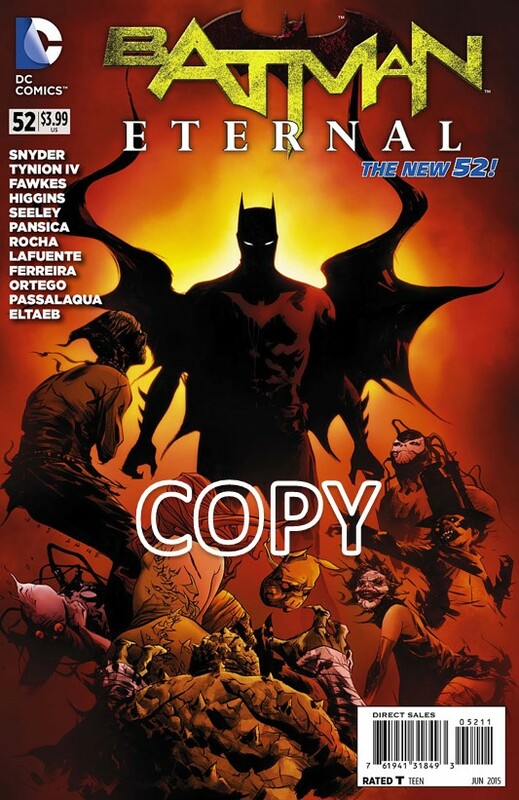 Did the New 52 need Batman Eternal? I have no idea but I do think Batman Eternal will always have a place in my heart.